I did some more looking around and using Bing, found one more result which pointed to a PowerPoint slide deck by Ellis Cohen from his course on Theory, Practice & Methodology of Relational Database Design and Programming. In this deck I found an example of what he calls an entity instance diagram, which pretty much is what I thought it was. I’ve been creating an using these sorts of things to explain how a data model should be used but I never had a name for them. I called them sample data, data prototypes, data validation , worked examples, or just examples. Now we have a name and a TLA! I usually use Excel to prepare these, as I can reuse the data for each one. I even have an ER/Studio macro to generate the tabs in a spreadsheet (one for each entity/table selected in a submodel). This makes preparing the sample data go much faster. So it looks like we have an answer now for what the heck is an entity instance diagram….and I have a name for a technique that I use all the time. If you have other examples of this term, I’d love to see them. I’ve uploaded a much more detailed checklist for what to do when you inherit a data model from someone else. I panic for a moment, fearful that the computer has frozen and that I’ve lost all my work — something that happens all too frequently. But I soon realize that this is not the case. Instead, I’ve come up against a word limit. It turns out that in our electronic medical record system there is a 1,000-character maximum in the “assessment” field. While I’ve been typing, the character number has been counting backward from 1,000, and now I’ve hit zero. The computer will not permit me to say anything more about my patient. If you’d done any database design, you know that even if you design a good, business-driven design, others who use the database might apply their own rules to the data on the way in or out of the database. I remember designing a Point of Sale system database for an appliance retailer. Our data model needed to support the selling of high-end appliances as well as bulk purchases for high-end appliances. So our transaction amount columns were significantly large. A developer on the application team thought our monetary field lengths were insanely large, so he enforced a limit on a transaction of $9,999.99 for the total transaction. To make matters worse, this system went all the way into production with that limit. So on day one of the roll out, sales people couldn’t sell the most highest margin items such as a professional quality stove ($14,000) or sell to developers who were buying 100 low end stoves in one transaction. Their orders had to be chunked up into tiny $9,000 mini-transactions. Order completion was taking hours instead of minutes. Credit cards were being rejected for too many large amount transactions back to back. In other words, a nightmare deployment because organizations trying to spend tens of thousands of dollars were walking out and going to other retailers with “real systems” to make their purchase. However, no lives were being lost (that I know of). Some people may have gone longer without heat (furnaces) or with rotten food (freezers and fridges), but in the overall scheme of things the impact on customers was not life and death consequences. If we get back to Dr. Ofri’s situation, though, she was faced with a terrible data dilemma: how to describe a complex patient history in 1000 characters. This number probably sounded like a huge number when the project team was adding that “feature” to the system. I’d even bet their own test data only went as high as 200 characters or so. I’m also guessing that since this system is a fairly high-risk project that some expert user (or many) was responsible for approving the design of field lengths. Perhaps he or she also thought that 1000 characters was enough. In desperation, I call the help desk and voice my concerns. “Well, we can’t have the doctors rambling on forever,” the tech replies. That response from IT (even if it a help desk tech who has no clue as to why there is a limit) makes me mad and afraid at the same time. You’ve all heard it in your design reviews, haven’t you? That’s way too long of a field. The business users are frightened by the negative comments and agree that 25 is sufficient for e-mail address, not even realizing that some of their own e-mail addresses are longer than that. As I blogged recently about Over Modeling, it’s only over modeling if it doesn’t meet the business need. Sure, we might make concessions to technical feasibility (“make every column 2000 characters, just in case”), but our designs should be business driven. I’ve finally condensed my patient’s complicated medical conditions to exactly 1,000 characters. I quickly hit “save” before I lose everything. I wish him good luck on his operation, wondering if his surgeons will have to condense the entire operative report to 1,000 characters as well. What happens if there are complications? For my next medical evaluation, I think I will use haiku. I don’t know about you, but I wouldn’t want to read that about my own patient record. This post is a rerun from 2009, but the truth is still there. It’s a Wonderful Life is a part of many a holiday tradition. While most of you probably know this as a Christmas film, the links to the Christmas holiday are fairly weak. There’s an angel, some snow, and a background Christmas tree with a bell. Other than that the story itself could take place at any time of the year. So if you’d put off seeing this film because you think it is all happy, shiny, Christmas cheer-ish, you need to think again. George Bailey is a protagonist in a small town, Bedford Falls, located in upstate New York. He finds himself on the brink of financial ruin due to no fault of his own. He goes to visit the town big wig and resident bully, Henry Potter, to get a loan. Potter tells him that with no equity in his life insurance policy, he’s “worth more dead than alive.” In a fit of despair, George decides to sacrifice his life so that his family and company (The Bailey Building and Loan) can survive. However, his plans are side-tracked by Clarence, his guardian angel. George rambles that he wished he’d never been born. Sounds pretty dark, doesn’t it? Not that Christmas-y at all. Clarence sees this as a great opportunity to show George just what a great impact he has had on not just his community, but on the world. The “feel good” part of the film is when George gets to return to the world he wished he’d never been born into. I’ll leave the assignment up to you to see how this all happens and how George and his family do once he returns. I’ve seen this film at least 50 times in my life, perhaps even more. In fact, most people would probably think that I’m a bit obsessed with this whole story. To which I say: everyone needs a hobby. This just happens to be one of mine. So what does this have to do with architecture and data management? I think plenty. Enterprise-class projects can’t be done by one person. No one is a failure who has good team mates who collaborate well. You don’t have to be friends with them, or even like them that much. But you do have to find a way to collaborate with them. Architecture done well can have all kinds of impacts elsewhere. Each architect’s work touches so many other parts of the architecture. When it isn’t there, it leaves an awful hole…to be filled by a non-architect to do. One small great architecture component can have huge impacts on solution quality for a long time in the future. When George is a kid, he saves his brother Harry’s life. But in the Pottersville world, Harry dies. Clarence tells George: Every man on that transport died! Harry wasn’t there to save them, because you weren’t there to save Harry. If you aren’t there to create the architecture, or if the architecture you create isn’t used, then the good stuff it could deliver won’t be there when it is needed. Fastest isn’t always “bestest”. In running George and Clarence out of his Pottersville bar, Nick the Bartender explains what works in the bad world: Hey look, mister – we code fast here for people who want to get lots of stuff done fast, and we don’t need any characters around to give the joint "atmosphere". Is that clear, or do I have to slip you my left for a convincer? Well, I paraphrased that quote. But you get the point. Perhaps that was Nick’s collaboration method – using bouncers to run people out. Some people feel that data and other architectures are just there for some sort of religious checklist nirvana. It’s our jobs, as architects, to show them why architecture plays a key role project success. A left convincer might work in the short run, but the best way to get support for an architecture is have one that works. Good architectures need to be designed. Hacking away on a pseudo architecture is more Pottersville than Bedford Falls. Architecture is more than drawing boxes and lines. George was fabulous at motivating people to do the right thing. The first way he did this was by living by his own principles. When put in a tight spot, he did the right thing. We architects need to do the same thing. We can’t tell development teams that they must treat data with respect and then treat our own meta data as if it weren’t important. This means ensuring that our architectures are managed with real tools, backed up, disaster-proofed, and generally treated as production data – which they are. I’m still not sure how I’m going to work that line in with one my vision/architectural reviews, but I’m still thinking about it. Look for it on call soon. Carolyn’s Sill’s video and song “George Bailey”. This is one of my favourite holiday running songs for the tempo and overall good feelings it leaves me with. Her songs are available on iTunes. While you are watching this video, head over to iTunes and buy it. As an independent artist, she deserves the 99 cents for putting this together. 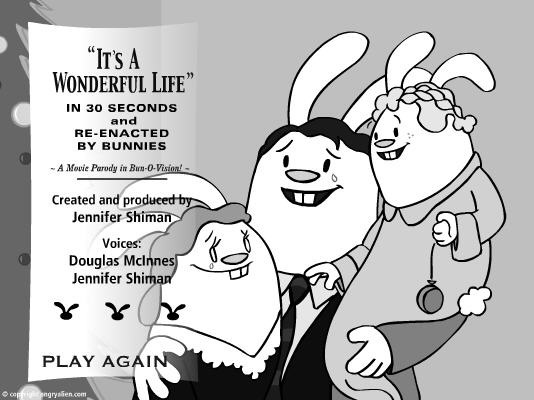 Next up is Angry Alien’s It’s A Wonderful Life in 30 Seconds with Bunnies. A 30 second overview of the film. Be sure to click on the bunny outlines at the end to see some clips that couldn’t be part of the 30 second summary. Finally, dear reader, I want you to know that you personally touch many lives by being part of our communities, both here and on Twitter.